I was reminded of this John Green quote while writing this, and I think it’s something we forget. Passion is a good thing. It’s the driving force behind so many great achievements. No great works of art or sporting successes or breakthrough inventions came about by accident. They happened because the people behind them worked hard and poured their hearts into it. And surely, we all want to find a bit of happiness in life, so we should do what we love, regardless of the opinions of others. Giving up something you love because of the opinions of others will only make you miserable. And if we all only liked the same things, the world would soon become a far less interesting place, as creativity and imagination would be stifled. Some people are lucky; their passions become their jobs or they succeed in following their dreams. For others, there are some limits; as unappealing as it may seem, sometimes we do have to face reality and do the boring stuff sometimes. And don’t let your passion eclipse the rest of your life and lead you to neglect other things that are important. Just as long as we make time for our passions too. If you really love something, you shouldn’t have to downplay that around other people. The world is not perfect, and will probably always have judgemental people in it, which is just an unfortunate truth. But try as hard as you can, not to let them squander your passion or ridicule you for doing what you love. 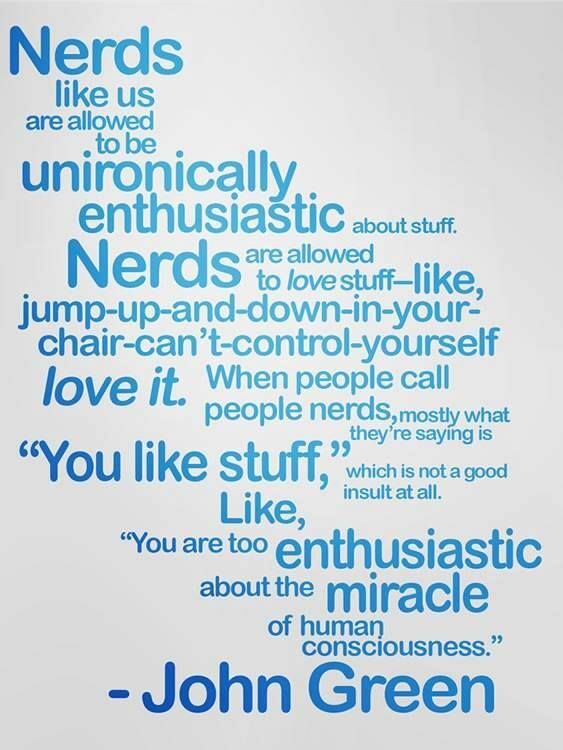 So get excited about things. Go to the midnight release of the new superhero film. Follow your favourite band around the country. Devote as much of your spare time to drama or music or sports practice as you can. Give up everything to travel the world. Chase your dreams. Whatever it is that makes you happy, pour your heart into it. Don’t compromise on it because of people who, in the end, won’t really matter.